Notes are a great way to store any information that you want to keep for later use. If that information is sensitive and important such as your draft message, phone number, hotel reservation number, etc. then you may want to make these notes private on iPhone. Fortunately, there are a number of ways you can achieve this. 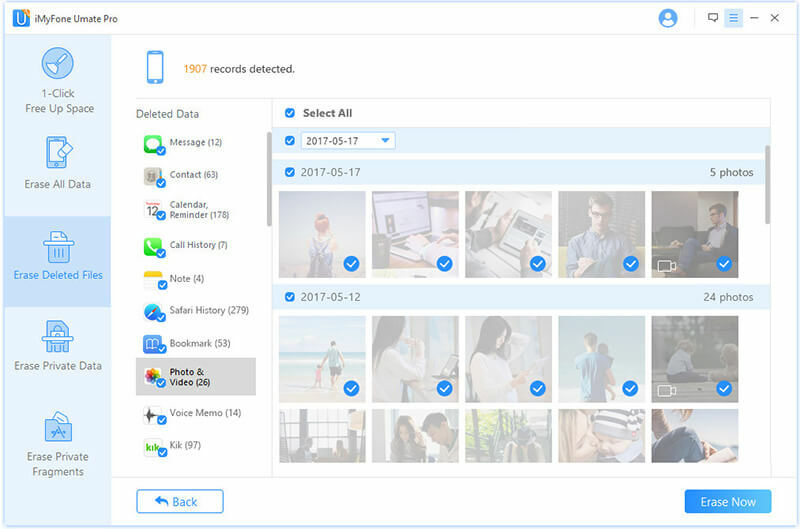 If you no longer need the important information stored in your notes and want to protect your privacy by permanently deleting them, then it is recommended that you use iMyFone Umate Pro. This software provides a variety of data erasing solutions for iOS users. You can scan and erase any type of file from your iPhone permanently via this software. By permanently erasing your notes via Umate Pro, you will make sure that no one can recover them and there is no risk of privacy leak. Permanently erase any or all your iPhone data conveniently. 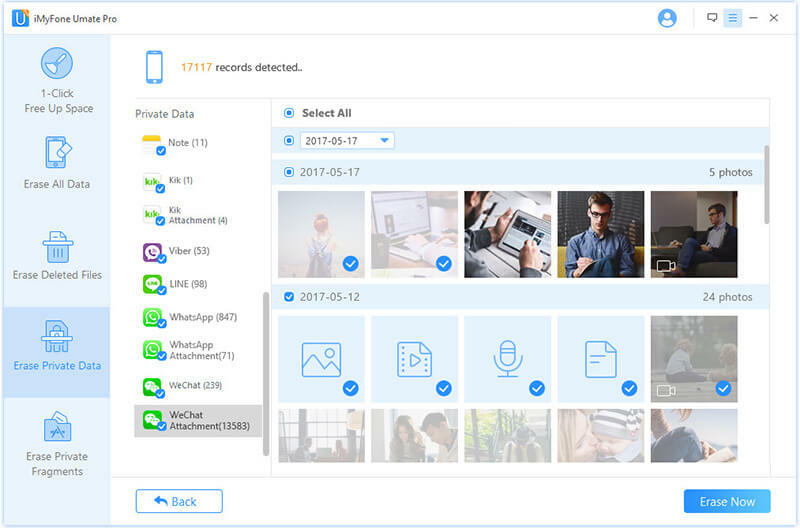 Scan and permanently erase private data, including notes, notes attachment, photos, videos, messages, etc. 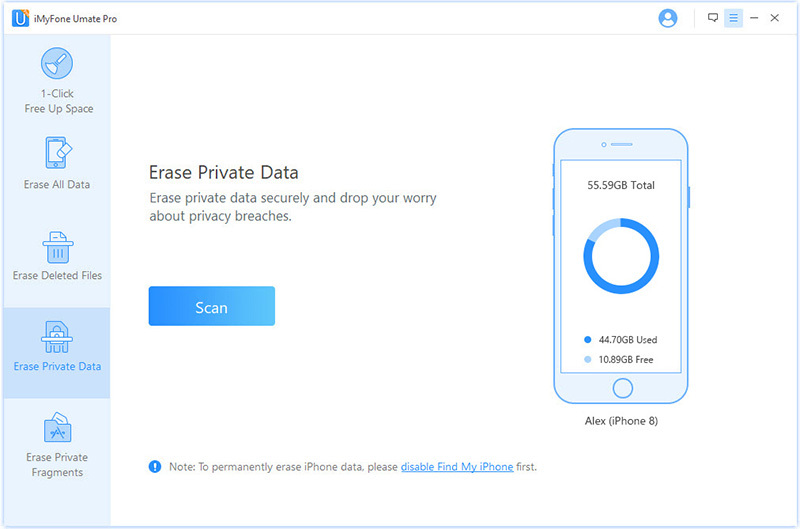 Scan and erase deleted data from your iPhone permanently. Preview your data before you delete it. It prevents accidental deletion of data. Permanently wipe data fragments of third-party apps to avoid privacy leak. Step 1. Connect your iPhone to your computer and open iMyFone Umate Pro. Step 2. Choose Erase Private Data mode from the home screen and click the Scan button on the next screen. Step 3. Once the scan is finished and you see a list of private files, click Note section and then select the notes that you wish to permanently erase. Then click Erase Now. You an also make notes private on iPhone by locking them. When you try to protect a note for the first time, you will be asked to set a global password. You can also set the password later if you want. Step 1. Open Notes app, find a note and select it. Step 2. Use the Share button and then tap the Lock Note option. Step 3. 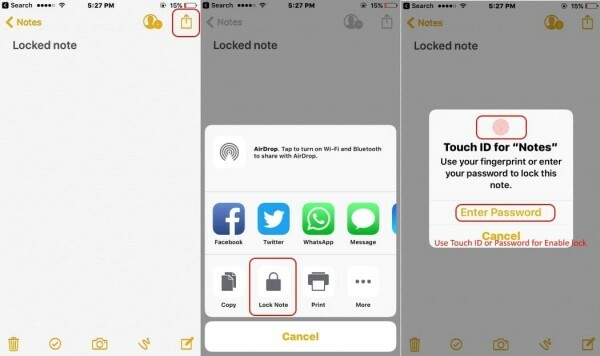 Now you will need to enter a password or use Touch ID for protecting your notes. After you perform the above mentioned steps, your notes will be automatically locked. If any of your notes is unlocked, then you can manually lock it at any time. There are two ways to delete notes from iCloud. You can either delete them via the Settings app or you can visit iCloud.com and delete them from there. Visit iCloud.com on your favorite web browser. Now navigate to Notes and select the notes that you wish to delete. Then click the Delete button to remove them. When you delete notes from your iPhone, they are note permanently erased and can be easily recovered via a data recovery software. This can be a huge privacy risk. To protect your privacy, it is highly recommended that you permanently erase those deleted notes. iMyFone Umate Pro will help you do just that. 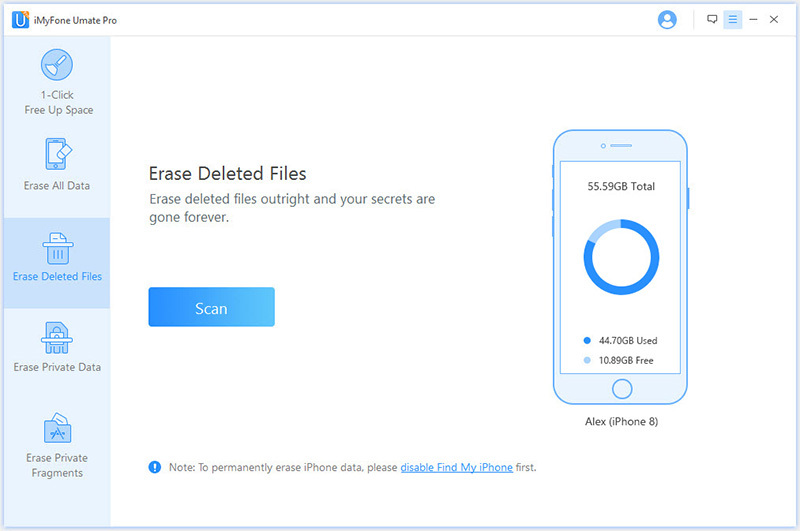 Its Erase Deleted Files mode can scan your iPhone for any deleted files and then erase them permanently, making them 100% unrecoverable. You can use this mode to erase your deleted notes permanently and protect your privacy. Step 1. Choose Erase Deleted Files mode and then click on Scan button. Step 2. After the scan process finished, you'll see the list of deleted data: Message, Contact, Calendar, Reminder, Call History, Note, Safari History, Bookmark, Photo & Videos, Voice Memo, Wechat. Check Note and then the one you want to delete. Step 3. Click on Erase Now button, then all your selected notes will be erased permanently.